From: In Harmony with Nature Animal Haven, Orlando, Fla.
Molly Grace's story originally appeared on Andrea's blog, Run, Eat, Date, Sleep. You can see even more photos in her post! It's been a dream of mine for quite some time to adopt a beagle. I've just been waiting on a landlord nice enough to allow pets and some financial stability. Everything recently fell into place, and I caught myself browsing Petfinder. 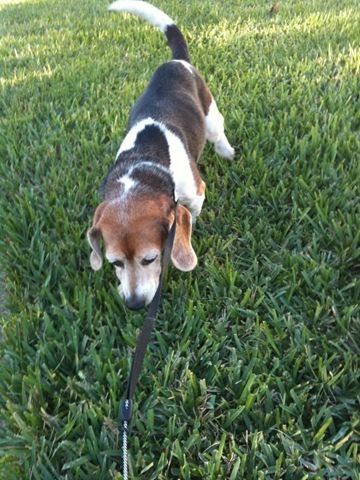 I usually search for the following: beagle, female, young, and adult. But this time, I didn't eliminate seniors from my search. 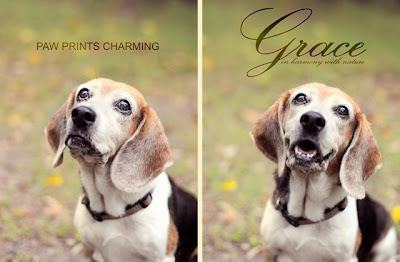 Grace's picture stole my heart, and my heart broke as I read her bio. 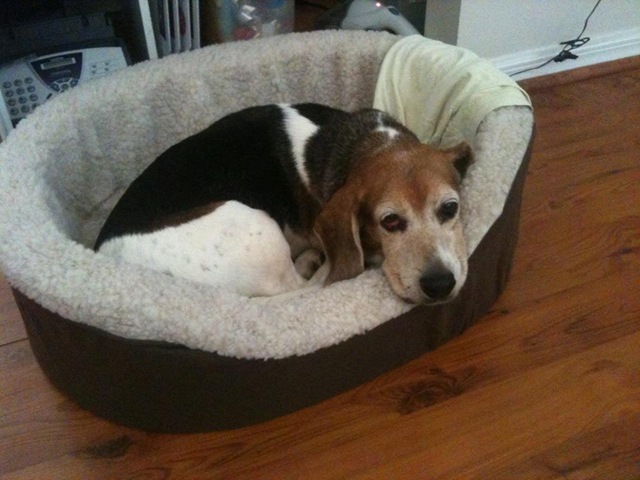 She was a 9-year-old beagle just looking for a lap to lay her head for the remainder of her life. It only took me a few minutes to decide to email the animal haven where she was living, and I heard from them the next day. I quickly filled out the application and heard back from them the very next day. Karen, the owner of the animal haven, called to tell me I had been approved and gave me Grace's history. She was presumably used for hunting, and the animal haven had rescued her just a month earlier from a kill shelter in Georgia. 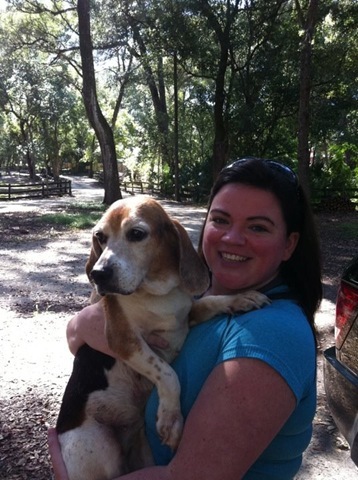 She was scheduled to be euthanized at the kill shelter, but they rescued her beforehand. On Tuesday, I was scheduled for a meet-and-greet to see if we got along. From the moment I saw her, my heart melted. I knew she was my dog. The trainer at the animal haven filled me in with more information as well. She was most likely an outdoor dog all her life, so she probably wasn’t potty trained. They probably fed her at the same time with a bunch of other dogs by throwing the food on the floor, so she probably had to fight for her fair share. She also clarified that the vet thinks she's between 6-8, not 9 like we originally thought. Her ear canals are pretty tight, and she’ll need surgery so that an infection doesn’t grow in there. Thankfully, the animal haven will be picking up the tab for her surgery. They also told me I could change her name since she was only named Grace a month ago. So, Grace became Molly Grace. My mind was already made up before I even met her, but visiting her just made me want to take her home even more. We agreed that I'd be back on Wednesday (the next day) to pick her up, and then I left to make a trip to Petco where I purchased her food and water bowls, food, treats, a bed, and some toys. When I came to pick her up on Wednesday, she was inside getting all gussied up for her new home. When Karen brought her out in a towel, my heart absolutely melted. This was my little girl! She was shivering from just being bathed, and she was probably really nervous. They gave me her medicines and her medical history, and we were on our way! It didn't take her long to get settled in the passenger seat. She got a little anxious when we were halfway home, but all she needed was a little petting. As soon as we got home, I took her on a long walk and then introduced her to her new home. She sniffed every square inch and then quickly found her cozy bed. We took walk breaks every two hours and food breaks every four hours. When I was at my computer working, she laid right behind me. When it came time for dinner, I made sure to feed her right before I sat down to eat so we would eat as a "pack" like she was used to. But she eats so much quicker than me, so she spent the next 10 minutes staring at me while I ate. No barking or whining while I ate. Just staring. We went to bed a little early. I brought her bed in next to mine, but she found a pillow in my closet she liked better. I didn't sleep too well that night. I kept waking up to make sure she was breathing. Kind of like the first time I babysat my nephew when he was an infant. The morning brought a really early inventory shift at lululemon, so I had to leave her in a confined area for seven hours. She still hadn't pooped since I brought her home, so I was worried throughout my whole shift that I would come home to a really messy bathroom. I left her in there with her pillow, her bed, her toys (which she still doesn't play with), and her food and water. When I came home, she didn't even hear me come in the door. She was fast asleep and snoring with her little head on her pillow, and no messes were on the floor. Yay! She did her business outside when I got home, and she got an extra big treat for being such a good girl! Today has been a good behavior day as well! She's been enjoying long naps and long walks. She met a few furry friends on her walks today, and she just stared at them and didn't bark. And she got a few compliments from our neighbors about how cute she is! She's been a fantastic addition to my home. She gives (and receives) so much love! I love that she follows me everywhere and needs to be in the same room as me. My life has definitely changed since adopting her. My life is not entirely my own anymore. Her needs come before mine, and I'm completely okay with that! I'm so glad she's my little girl, and I'm especially happy I decided to adopt a senior dog who only needed a loving home.